Last week I saw a woman at Costco with a cart entirely full of asparagus, which got me thinking. Snap off the woody asparagus bottoms and place asparagus in single layer on a baking dish (I used a cookie sheet with a lip and lined it with foil). Drizzle asparagus with good olive oil. 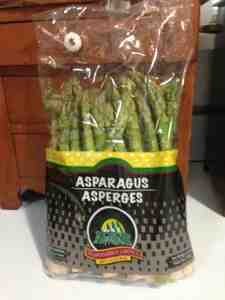 Bake asparagus at 400 for 10 minutes. Rearrange spears, cook a few minutes more. I served with rice, chicken and fresh bread. Baking this way preserved the fresh taste - I'm going to be cooking this again. I always make my asparagus this way. I never had before, but I'm sold.